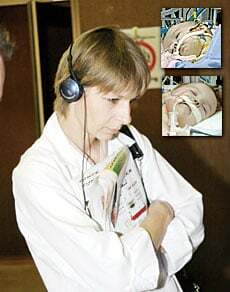 RIYADH, 5 January 2005 — Wieslawa Dabrowska, the mother of the Polish conjoined twins who were separated after an 18-hour marathon surgery, jumped in joy when the success of the operation was announced at the King Abdul Aziz Medical City for the National Guard. “At last my dream has come true with the support and assistance of the Saudi government,” she said, claiming that separation of her babies was the happiest news in her life. The 37-year-old seamstress mother was tense at the commencement of the surgery but gradually became relaxed as Monday’s surgery progressed. Daria and Olga Kolacz were born on Oct. 8, 2003 at the Centru Matki Polki Institute in Lodz, Poland. They were brought here after Crown Prince Abdullah agreed to a request by their mother to have a surgical intervention to separate them. “Of course, I was nervous when the surgery started. However, I overcame it with the confidence I had in Dr. Abdullah Al-Rabeeah’s surgical team... They did a great job,” she said clasping her hands. “Until now I had one bed for my children... Now I could put them on two beds because they are two separate siblings,” Dabrowska told Arab News speaking about her feelings after the successful surgery. “I am ever indebted to Crown Prince Abdullah who gave the green light for the surgery to enable my children to lead a normal life,” she said, expressing her sincere thanks to the hospital and the Polish Embassy staff who gave her the fullest cooperation. Deputy Head of Polish Mission Andrzej Wozniak told Arab News that Poles not only treat the surgery as a miracle but they are also grateful to Crown Prince Abdullah for his noble gesture. Poles watched the surgery live via satellite telecast arranged by the Saudi Television.